HEAD STRONG: "Today, I'm wiser than I was in my early days," offers the sprinter. 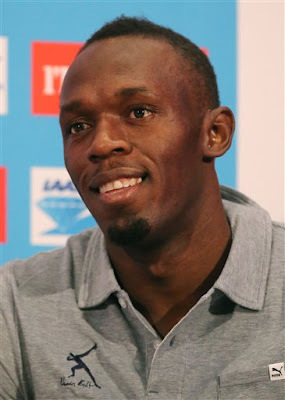 The planet's fastest man, Jamaica's Usain Bolt, will have the world's full attention (yet again) on Saturday, when he takes to the track to compete in the 200M sprint, inside the Stade de France, at the Meeting Areva in Paris, the latest leg on the 2013 IAAF Diamond League circuit. Following the speedster's arrival in the City of Lights on Tuesday, he sat down for a press conference with journalists, who readily quizzed him on everything from his preparations for next month's Moscow World Championships to what still drives him forward in his life and career. "I like competition. I still get as much of a kick out of it. The more I run in competition, the more I want to surpass myself," he says. "My challenge over the next three years will be to go right to the end of the Olympiad while remaining at the top. To achieve that I'm going to have to maintain the same level of performance, season after season. I'm ready for it though. I'm working towards that every single day." And when it comes to his strength and fitness and the essentials required to stay in tip-top shape, Bolt says he is way more versed now in what needs to be done. "Today, I'm wiser than I was in my early days," offers the sprinter, who also turns 27 in August. "I've understood that my body needed more attention, that it wasn't responding the way it used to. I don't allow myself certain things that I permitted in the past."